A pancake is a thin batter cooked on a hot surface. The batter's base recipe is made by mixing flour with a liquid. Some of the flour used in pancake include all purpose flour, buckwheat flour, self raising flour, oatmeal flour, wheat flour, cornmeal flour, semolina flour, rice flour, tapioca flour, corn flour, teff flour and millet. Often a mixture of flour and dry ingredients are mixed to achieve the batters consistency and desired result. Some examples of the liquid can be water, alkaline water, milk, buttermilk, yogurt, coconut milk or beer. Some pancakes have bread like quality and may contain yeast or may be fermented. Depending on the region, pancakes have a variety of toppings. There are varieties of sweet and savory pancakes. Pancakes may be served at any time for breakfast, lunch, dinner or as a snack. Pancakes are probably the oldest form of bread. Pancakes, or similar to what we call pancakes today, were eaten in ancient roman and medieval Europe. Dosa, a South Indian crepe made from rice and black lentils, is noted in the Tamil Sangam Literature from 100 BC to 300 AD. The first tortilla dates back to 10 000 BC. Today pancakes are enjoyed by almost every culture or region around the world. In North America pancakes are sometimes called batter cakes, griddlecakes, or flapjacks (US) and are usually leavened with baking powder or baking soda and are served with syrup. They are served for breakfast sometimes with fruit compote, maple syrup, butter. Mexican Hotcakes, are similar in style to pancakes served in the U.S. Hotcakes are more often made with cornmeal as well as or instead of wheat flour. They are topped with different sauces such as condensed milk fruit jam or a sweet goat milk spread called cajeta (taste like caramelized condensed milk, Mexican "dulce de leche"). You can find street vendors in Mexico selling hotcakes. Malaysia/Singapore Apom Balik (Pancake Turnover in Bahasa), Ban Chian Kuih - Pancakes usually filled with sweet toppings and may contain grounded roasted peanuts, sweetened dessicated coconut, corn, egg, bananas and sugar, often sold by street vendors. There are several versions of this sweet dessert type pancake. Some have a thicker batter, cake like and spongy, folded over with the topping in the middles. My favorite are the thin, crispy ones filled with crushed roasted peanuts, sugar and sweet cream corn. They are both cooked on one side then folded in half. A warm sweet dessert pancake. El Salvadore Papusas/Pupusas - is a thick, corn biscuit-like flat bread made using a maize flour. It is normally stuffed with cheese, beans, or fried ground pork. My favourite was the queso (soft Salvadoran cheese called Quesillo) and Salvadorian chicharrón (Fried Pork). Served with some fresh tomato salsa sauce and curtido (pickled coleslaw). Vietnam's Bánh Xèo - A savoury pancakes made out of rice flour, water and turmeric. Some versions use coconut milk and saffron instead of tumeric. Depending on the region, but normally stuffed with thinly sliced pork, shrimp, and bean sprouts. Served with nuoc cham (Vietnamese fish sauce, lime juice, chili). Often served with fresh greens and herbs. I remember literally begging my gandma to make this pancakes when I was a child. Her version was the best I've ever had. South India's/Sri Lankan Dosas - Regular dosa batter is made from rice and split skinned urad bean (black lentil) blended with water and left to ferment overnight. The batter is spread thinly like crepe on a hot tava (griddle) greased with Ghee (Indian Clarified Butter). Dosa's are wheat and gluten free. It is often eaten with your hand, accompanied with an array of side dishes: sambar, coconut chutney, mint/corinader chutney, dahl, pickles, chillis, fish/chicken/mutton curry or dry spices/salt/sugar. Eggs, fresh sliced chillis and onions can also be added to the batter during the cooking process. Dosas can also be stuffed, the most common stuffing is the masala dosa (stuffed with potatoes, onion cooked with masala spices). My favourite dosa is the rava dosa (semolina) with some fresh slice chilies with a cracked egg. Served with dahl, sambar and tomato chutney. Masala Dosa served with a coconut chutney, dahl and sambar. French Crêpes - A crepe is a very thin pancake cooked on one or both sides that is rolled and stuffed. Crepes are made from a batter usually consisting of flour, eggs, milk, butter and a pinch of salt. They are generally served rolled or folded around a filling. Crepes can be sweet or savory. They are lightly sweetened and filled with things like berries or fruits. English pancakes are similar to French crepes. They have three main ingredients: eggs, flour and milk. They may be eaten as a sweet dessert with the traditional topping of lemon juice and sugar. You see crepe cafes popping up around the world now with many new ideas and topping ideas. Crepe is extremely versatile, with over a century of crepe recipes it wouldn't be difficult to find one that you will love. A fresh Crepe loaded with chicken shawarma, cheese and onions from a vendor in Montmartre, Paris. French Galette - A large, thin buckwheat flour pancake. A savory crepes made from buckwheat flour and filled with cheese, meet, fish or vegetables. One of the most popular varieties is a galette covered with grated emmental cheese, a slice of ham and an egg, cooked on the galette. In France, this is known as a galette complète (a complete galette). Galette are normally cooked on one side, wrapped with savory toppings and sometimes enjoyed in place of bread as basic food in regions of Normandy and Brittany. My favorite galette experience was in Paris at an organic farmers market. The proprietor insisted that I would not find another place that served his galette pomme de terre (Potato Galette). Served warm the flavors of the organic farm fresh eggs, potatoes and onions stood out and it complemented the of tartness. Galette Pomme de Terre from a stall at an organic market in Paris. Dutch Pannenkoek - Pannenkoek is Dutch for pancake. Pannenkoeken are usually larger (12') and thinner (thicker than a crepe) than American or Scottish pancakes. The base ingredients are flour, milk, and eggs, and the batter is left overnight so there are less bubbles that form when cooking. There are sweet and savory toppings similar to the french crepe, though pannnekoek are thicker and may include beer in the batter for flavor and acts as a rising agent. Plain ones are often eaten with white sugar, brown sugar or Dutch stroop (dark, thick syrup). They can be served in place of regular pancakes, and make an excellent bottom for the traditional egg Benedict with Hollandaise sauce. Pannenkoek are extremely versatile and can be topped with or accompany fresh fruit, cheese, meat, smoked fish, starch and eggs. One of my favorite pannenkoek, includes hash-brown potatoes, crispy bacon and onions inside the batter then topped with sharp cheddar cheese, sour cream and apple sauce. For those who love to load up on carbs, try a Nasi Goreng (Indonesian for fried rice) Pannenkoek topped with fried egg. Ethiopian Injera - is a pancake-like bread made out of teff flour. teff is rich in iron and only grown in regions of middle elevation with adequate rainfall. because of it's scarcity, many poor Ethiopian's farmer that grow their own grains; other flours are used to replace teff content in making injera. The teff flour is left to ferment similar to making a sourdough starter. As as result injera has a slight sour taste, similar to dosa's. Injera is a flat pancake commonly cooked on a clay plate (mogogo) place over an open fire. Injera has a spongy cake like texture and sometimes served as a tablecloth covering the table. You then tear pieces of injera with your hands and use it to scoop meatless stew, vegetable sides, salads, cheeses, crunchy peanuts and herbs. Injera soaks the sauces of stew well, the sides of saucy, spicy and cooling sides. Injera at the bottom of a potpourri of flavors and texture. Jewish Latkes - Latke is Yiddish for potato pancake. Latkes are made with shredded potato and egg, sometimes with grated onions, cheese, spinach, zucchini can be added. Traditionally served with sour cream or apple sauce. Note that Russian, Belarussian, Czech, Ukrainian, German, Hungarian, Polish, India and Korea cuisine also have similar potato pancakes. Latkes can be cook on a flat-top, griddle, pan-fried or deep fried. There are versions that call for cooked and mash potato similar to a croquette. 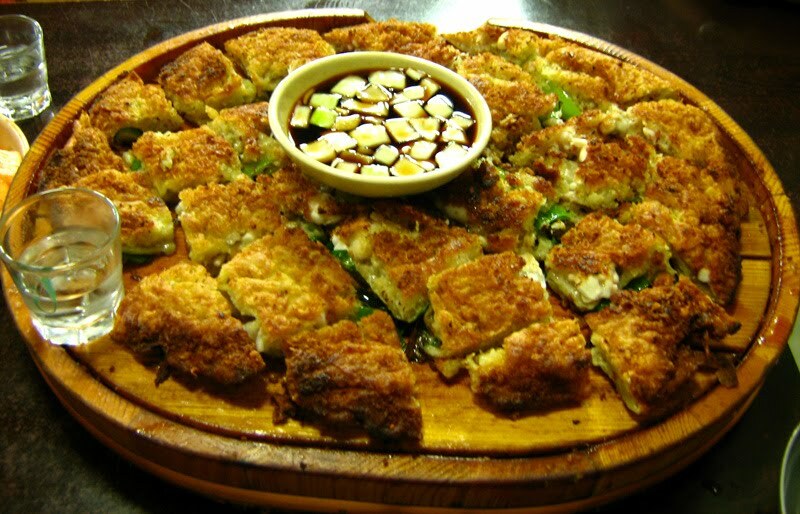 Korean Jeon - Jeon (also spelled jun or chon) literally translates to pancake in Korean. It is enjoyed by Korean Royal Court to farmers and peasants alike. There are many interpretations of the jeon, and it's variation in name is ofter associated with the other main ingredient [i.e. kimchijeon (kimchi pancake), pajeon (green onion pancake), ganjeon (beef liver), hwajeon (flower/sweet pancake)]. The batter is mainly flour and water. And, depending on thee style, may be mixed with a fry (tempura) or egg batter. Ingredients such as sliced meats, poultry, offal, seafood and vegetables. Jeon is eaten as an appetizer to be shared before a meal, with other Korean side dishes or when drinking among friends. Jeon is easy to prepare and often cooked at home as part of a main meal. It is served with a soy sauce and vinegar mixture base. Japanese Okonomiyaki - Is a savory pancake containing a variety of ingredients. The name is derived from the word okonomi (what you want), and yaki (grilled). The batter is made of flour, grated yam, water or dashi, eggs and shredded cabbage. Ingredients such as green onion, meat (generally pork or bacon), octopus, squid, shrimp, vegetables, kimchi, mochi, cheese, yakisoba and yakiudon are added. Cooked okonomiyaki is topped with ingredients that include fried egg, otafuku sauce/okonomiyaki sauce, aonori (seaweed flakes), katsuobushi (fish flakes), Japanese mayonnaise and pickled ginger (beni shoga). There are restaurants where you sit in front of a griddle, a chef, and ingredients where you can personalize you okonomiyaki. Russian/Lithuanian/Polish/Ukrainian/Yiddish Blintzes - A thin pancake similar to a crepe except that yeast may be used. Prepared with wheat flour, buckwheat flour, potato flour oatmeal or millet with milk or water and egg. Bliny are thin, crisp pan fried pancakes that can be sweet or savory, commonly served with caviar and sour cream or folded over and filled with cream cheese or jam. It can be folded or rolled with fillings that include fresh fruit, fruit jam, mash potato, cottage cheese, caviar, cooked ground meat/chicken, or even a Chinese egg roll mix (bean sprouts, cabbage, onions). 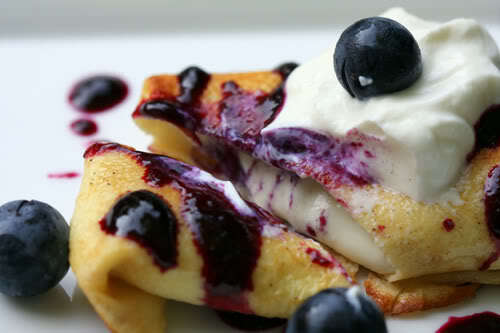 Blintz can be re-fried, deep-fried, sauteed or baked. China's Jian Bing - A Chinese crepe made from mung bean or millet flour, soy milk cooked on griddle. Then an egg is added followed by tian mian jiang (sweet wheat flour sauce), garlic/bean chili sauce. Then chopped green onions, Chinese parsley and crispy crackers (similar to deep fried wonton shells). There are some variations to this recipe. Other toppings/filling include scallions, chives, pickled vegetables, Chinese donuts, sausages, rice noodle, fried shallots, fresh cilantro, thinly shredded egg omelet, grated daikon, lettuce, crushed roasted peanuts and black sesame seed. It is an inexpensive (2-5RMB/USD.25-.60cents) and great tasting snack. Imagine the texture a warm soft crepe with the eggs together with the crispy, crunchy cracker with a sweet and spicy sauce. I would use chicken skin crakling in my Jian Bing. Simple and delicious! Jian Bing with green onions, crispy cracker, eggs, pickled vegetable. This are just some of the more common or well known pancakes that are enjoyed around the world. There are many many more great pancakes out there in the world to be enjoyed. Some other pancake or variants are the Irish Boxty, Welsh Cakes, Indian Uttapam, Taiwanese/Malaysian Popiah (wafer thin crepe), Chinese Green Onion Pancake, Costa Rican Arepas, Japanese Taiyaki and Chinese Bao Bing (Thin Crepe) used as a wrap in Moo Shu Pork or Peking Duck. So when you are tired of the the tasteless foam pancakes smeared with butter and syrup. Maybe it is time to start exploring some of the many other pancakes people from different regions have been enjoying. Hopefully you will discover and share some of this new comfort foods. Happy eating! This is the top read I read all month?!? I'm thrilled you took the time and wrote this? My developer is trying to convince me to movve too .net from PHP.